Thanks to a development team with a combined experience level of more than 150 years in manufacturing Tensar Geogrids, Tensar successfully re-engineered the geogrid structure by creating a revolutionary new product specifically designed for trafficked surfaces – Tensar® TriAx® Geogrid. With its unique triangular structure, TriAx Geogrid represents a revolutionary advancement in geogrid technology. Its multi-directional properties leverage triangular geometry, one of construction’s most stable shapes, providing greater stability and stiffness. 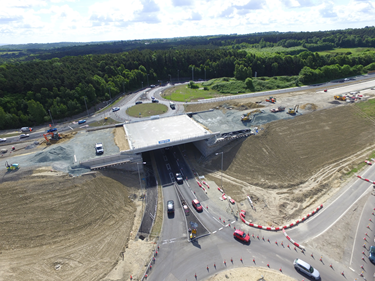 The change from a rectangular to a triangular grid aperture, coupled with an increase in rib thickness and junction efficiency, offers the construction industry a better alternative to conventional materials and practices. Through ongoing investment, product development and innovation, Tensar International continues to deliver the industry’s most cost-effective solutions for achieving optimal performance for both permanent paved surfaces and temporary solutions over soft soil. Biaxial geogrids offer tensile stiffness primarily in two directions. TriAx® Geogrids have three principal directions of stiffness that are further enhanced by their rigid triangular geometry. The triangular geometry provides a significantly different structure than other commercially available geogrids, delivering high radial stiffness throughout the full 360 degrees. Three-dimensional load distribution acts in a radial manner at all levels within the aggregate. This helps to ensure optimum performance of geogrid stabilization in a mechanically stabilized layer. 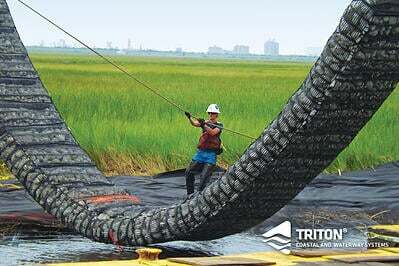 Thus, TriAx Geogrid is engineered to outperform Tensar® BX Geogrids by better distributing radial stresses. 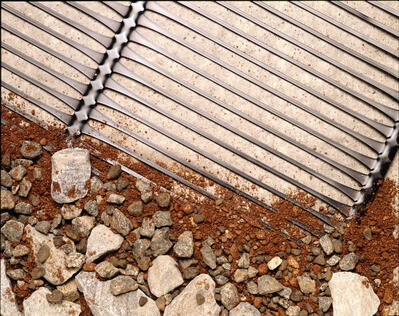 Aggregate particles interlock within the geogrid and are confined within the apertures. These interactions create a stiffened composite layer with improved performance characteristics. The structural properties of the mechanically stabilized layer are influenced by the magnitude and depth of the confined zones. Empirical and mechanistic research performed with TriAx Geogrid aid in quantifying this stiffness enhancement. TriAx Geogrid is formed with the same square-edged rib as our existing Tensar BX Geogrid but with an enhanced rib profile for confining aggregate material. Full-scale research has proven that geogrids manufactured with deeper ribs and square edges outperform geogrids with rounded edges and thinner ribs (1992, USACE Report No. DOT/FAA/RD-92-25). TriAx Geogrids’ unique aperture geometry forms a hexagonal junction shape with superior junction strength and stiffness to mitigate radial stress imparted from a trafficked surface. This makes it the optimal geogrid for the application. TriAx Geogrid is manufactured from an extruded sheet of polypropylene. During the manufacturing process, each sheet is punched with an array of holes and then carefully stretched to create triangular apertures with greater confinement characteristics. This process yields a geogrid with a very high junction efficiency (ratio of junction strength to ultimate tensile strength) to offer optimal rib-to-rib stress transfer. This meets the need to effectively and uniformly distribute loads for both paved and unpaved applications. TriAx Geogrid’s near isotropic stiffness characteristics contribute to its improved performance in comparison to Tensar BX Geogrids in trafficked applications. 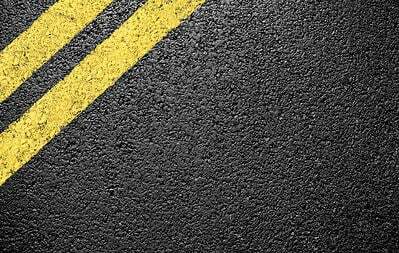 Such characteristics are ideal for improving the service life of paved and unpaved surfaces while further reducing excavation and pavement component thickness requirements. Just as important, TriAx Geogrid creates an enhanced, mechanically stabilized composite material for constructing over soft soils. The triangular aperture geometry more effectively dissipates the radial stress imparted by in-service loads. This new feature results in a better reduction of subgrade stresses while enhancing the durability of an overlying base or sub-base course. The greater rib depth and radial stiffness characteristics of TriAx Geogrid are more effective in confining overlying granular fill than the traditional Tensar BX Geogrids. This mechanism leads to an enhanced “snowshoe effect” over soft subgrades by locking aggregate particles more efficiently during the compaction effort. Trafficking trials have verified that TriAx Geogrids outperformed Tensar BX Geogrids through this unique feature. This stronger “snowshoe effect” is even more effective at spreading loads over a wider area of subgrade. 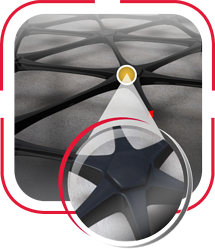 Tensar® TriAx® Geogrids offer unrivaled performance in paved and unpaved applications. Combined with the technical support and expertise of the Tensar team, TriAx Geogrid is the future of geogrid technology and, with its unmatched performance, the industry’s best solution for building low cost, long lasting and more reliable trafficked surfaces. Paved systems often fail prematurely because of progressive lateral displacement and weakening of the granular base course. TriAx Geogrid improves the overall stiffness of roadways, parking lots, taxiways, runways, aprons, intermodal facilities and other structures that support vehicular traffic, leading to enhanced performance. Improved performance of trafficked sections optimizes overall life-cycle costs by minimizing maintenance and rehabilitation intervals common to both flexible and rigid pavements. Weak subgrades are a common problem during the construction of haul roads, parking lots, working surfaces, staging areas, storage yards and other unpaved structures. TriAx Geogrid provides a simple solution for stiffening the granular platform and reducing subgrade stress. Enhanced constructability greatly improves site access while significantly reducing up-front costs and future maintenance. Even the most technologically superior products and systems need the right combination of expertise and support to perform at their maximum potential. We put our full resources and decades of technical knowledge and practical experience behind TriAx Geogrid to ensure optimum results. Our technical team of engineers and sales managers is ready to support your most challenging project requirements using the highest quality products, services and design methods. 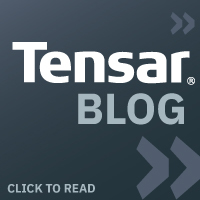 The goal of Tensar is to ensure our clients receive the best performance and most cost-effective solution. The Tensar team and our worldwide distribution network are dedicated to providing the highest quality products, service and design support. With a technically trained sales staff and an in-house engineering department, Tensar stays at the forefront of today’s design technology and market trends.